A version of this piece originally appeared on Sojourners’ blog. In the fall of 2008, I met for the first time with my local member of Congress, Representative Spencer Bachus of Alabama. As a sophomore at Samford University, I was nervous and far from an expert on the topic of discussion: transparency of companies in the extractive industries. Little did I know, after four years of advocacy efforts with activists across the country that I would be sitting in the U.S. Securities and Exchange Commission, or SEC, last Wednesday to hear the commissioners release and implement two monumental rules from the 2010 Dodd-Frank Financial Reform Act: section 1502 on conflict minerals and section 1504 on anti-corruption of state oil and gas contracts. Specifically, after section 1502 was signed into law as part of the Dodd-Frank Act in July 2010, advocacy efforts were directed at the implementation of the rules and regulations for companies on how to source minerals—a task for the SEC as mandated by law. The rule will require companies to publicly disclose whether or not they use conflict minerals—tin, tungsten, tantalum, and gold—that originated in eastern Congo or neighboring countries in the manufacturing of their products. Overall, the conflict minerals provision will have a positive effect on promoting peace and stability in Congo—but a slow one. The rule gives major companies a two-year window to implement the regulations, despite the fact that the slow release of the rule has already caused an inherent one-year delay. According to the SEC, both provisions drew in some of the most intense public pressure, generating hundreds of phone calls to their offices and thousands of petition signatures for the release of strong rules. 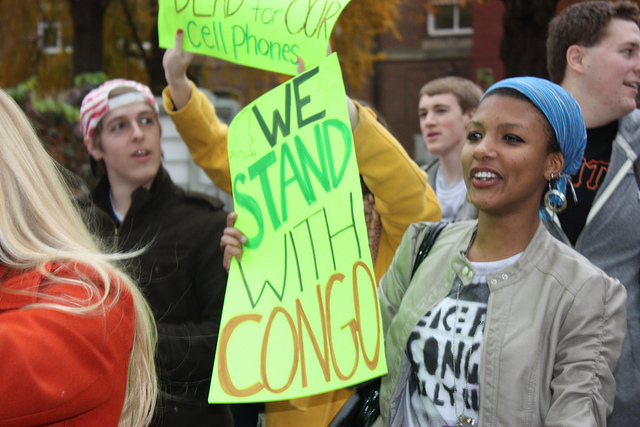 Many of activists who understand their unique connection to the conflict in eastern Congo through consumer electronics products have joined organizations like the Enough Project and faith communities to raise their concern as consumers to pressure electronic companies and governments to clean up the supply chain of conflict minerals. It’s been a journey of advocating with Congolese civil society for a clean supply chain that benefits rather than destroys communities in eastern Congo. It is important for activists to celebrate these wins, and despite the long journey, they should also stay committed to advocating with Congolese civil society for peace in the region. The passage of the rules on transparency and conflict minerals is a strong example of why we need dedicated activists to stay engaged and help create a sustainable constituency for justice and accountability in eastern Congo. The movement for conflict-free products starts with the individual and his or her decision as a consumer to demand ethical sourcing by electronic companies and governments. The Enough Project has designed a consumer guide to help you understand what actions companies are (or are not) taking to contribute to the creation of a clean minerals trade in Congo, and ultimately, the reduction of conflict there. Use your consumer power to make more responsible purchasing decisions. Send messages to companies you purchase from, reminding them how important conflict-free from Congo is to you.